A Tangmere restaurant owner has voiced frustration at ‘spurious’ objections to redevelop the site. ‘Cass’ and Viv, a husband and wife team who have run Cassons in Tangmere Road off the A27 since 2003, announced plans to retire and sell up in 2016. The restaurant was marketed for nearly a year but attracted little interest and the couple then engaged a developer to submit plans to demolish the building and construct a block of ten flats. 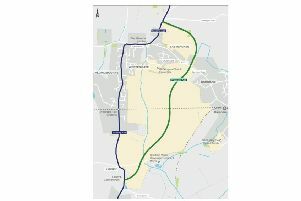 But Chichester District Council’s planning department has raised concerns about the potential noise impact of the A27 on future residents, the likely impact on trees around the site and the loss of a heritage asset. As a result the application has been withdrawn. Cass, 66, feels the plans were ‘not given a fair shake from the start’ by the council and labelled some of its objections ‘spurious’. The restaurant will go back on the market but he fears it may now be more difficult to sell and could impact their retirement plans. He has challenged the council’s predicted noise levels for new residents as ‘bizarre’ as the couple has lived at the site for years while customers ‘sit happily chatting away every night’ without any problems in the restaurant. Cass also countered suggestions the building is an important heritage asset. Given the national drive to improve housebuilding rates, he suggested the brownfield site is suitable for redevelopment, especially as the flats would be sold at the lower end of the property market. A council spokesman said: “The council considered two pre-application submissions in 2015 and 2016, to which concerns were raised in relation to those proposals. In 2017, an application was submitted for the demolition of the restaurant and erection of 1.5/2-storey block of 10 no. apartment flats. “The council consulted relevant professional bodies and concern was raised in relation to the potential noise impact of the A27 on future residents of the proposal, the likely impact on important trees around the site, and the loss of an important heritage asset. The applicant withdrew the application prior to any decision being made by the council. “While the provision of further suitable housing is a key priority for the council, the protection of both the natural and historic environment and the living conditions of residents of the district are similarly important.